saurel (SAWR-uhl) - n., any of about 14 species of elongated marine fishes of the genus Trachurus with a row of bony plates on its sides. Also called horse mackerel, jack mackerel, and skipjack -- and all of them quite edible. 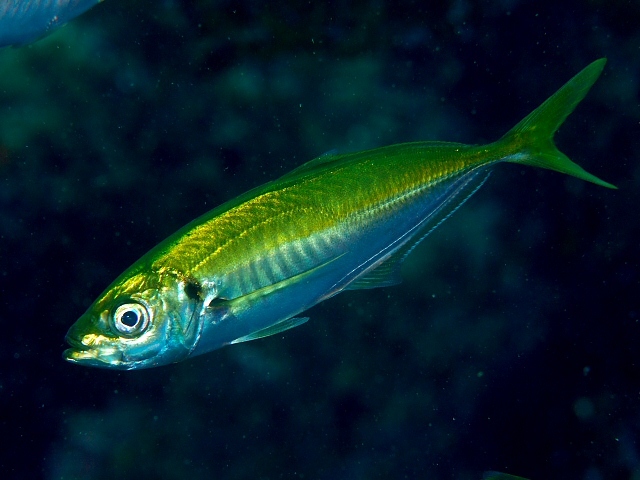 The type species is the Atlantic horse mackerel, T. trachurus or T. saurus, the latter species name being taken from the Late Latin name for the type of fish, from Greek saûros, both this type of fish and lizard (best known as part of dinosaur), of uncertain origin. To get saurel, pass the Latin name through French and while it's there tack a noun suffix -el on the end, and viola! peenge (PEENJ) - (Scot.) v., to complain, grumble, whine. One dictionary even says "to complain childishly," and the Dictionary of the Scottish Language also has fret/mope/droop senses. It's thought to be onomatopoetic with influence from whinge and peek. threap (THREEP) - (N. Eng. & Scot.) v., to scold, contradict, rebuke, bicker. n., an argument, quarrel; stubborn insistence. A broad-spectrum word of contention. Surviving now only in the north, this was mainline Middle English in the form threpen, to scold, from Old English þrēapian, to reprove/punish/blame, from a Proto-Germanic root, ultimately from Proto-Indo-European *trōw-, to beat/wound/kill/torment. dunnock (DUHN-uhk) - n., a temperate Eurasian sparrow (Prunella modularis). Better known as a hedge sparrow, and like many related birds is a grey-and-brown job that blends in well with the trees and hedges. The name is dun, which is a greyish-brownish color, + -ock, an Old/Middle English suffix used both as diminutive and to form descriptive names -- so "little dun one." raphe (RAY-fee) - n., a seam or ridge between two halves of an organ or other bodily tissue. Usually from having developed separately in embryo then joined together. Examples include the groove down the middle of the tongue and the frenum underneath it (lingual raphe) and the seam on the roof of the mouth (palatine raphe -- incomplete closure of which is a cleft palate). From medical Latin, from Greek rhaphḗ, seam/suture, akin to rháptein, to sew/stitch together. gighe (?) - n., plural of giga. Not in the sense of a billion of something, even though that's the only entry for giga that some dictionaries have (even ones that list gighe as its plural), but an alternate spelling of gigue, a lively baroque dance whose name is a Frenchified form of jig, a lively Irish dance (which in turn came from French again, in the Old French form gige meaning both fiddle and dance, from Frankish, from a Proto-Germanic root meaning to move and to wish/desire, from PIE *gheiǵh-). Which quite possibly makes this the most ridiculous obscure word yet in the Words With Friends dictionary. Sheesh. sadhe (SAH-dee, TSAH-dee) - n., the 18th letter of the Hebrew alphabet. And other Semitic alphabets as well. It is more commonly rendered as tsadi, as well as tsade or ṣādi, and its pronunciation in modern Hebrew is a voiceless alveolar affricate /t͡s/. In Yiddish, the letter is called tsadek. dhobi (DOH-bee) - n., (S. Asia) a person who does laundry. Also, in India, a caste of people who wash clothes. From Hindi hobī, washerman, akin to Sanskrit dhāvaka, washerman, from dhāvati, he washes, related to dhavala, white. abecedarian (ay-bee-see-dair-ee-uhn) - adj., relating to the alphabet; alphabetically arranged; learning or as if learning the alphabet, elementary, rudimentary.